Back in August Sony launched a rather gorgeous, and very limited edition, PS4 Pro console to commemorate the prestigious feat of selling 500 million PlayStation consoles worldwide. The 500 Million Limited Edition PS4 Pro features a stunning translucent blue case, which when the console is on lets you glimpse into the console’s illuminated interior. And, as luck would have it, GamesRadar+ has five of these beauties to give away. It comes packaged in a special collector's box, and inside you'll find your translucent blue 2TB PS4 Pro, along with some exclusive accessories. 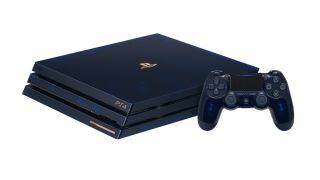 What makes this console extra special is that the PS4 Pro itself comes adorned with a commemorative copper plate on the front displaying its unique limited edition number. After all, only 50,000 of these consoles exist in the world, so you want to know which number you got. So, to be in with a chance of getting your hands on one of these stunning consoles all you have to do is share your favourite PlayStation memory of all time on this Twitter thread (with a screenshot if you have one), and we'll pick a winner on January 31. That means you have until midnight on January 30 to share your favourite PlayStation memory. Unfortunately, this competition is restricted to UK residents only. The competition closes on January 30, 2019. By taking part, you agree to be bound by the competition rules: http://www.futureplc.com/competition-rules/. Entries must be received by midnight on January 30, 2019 (UK time). Open to UK residents aged 18 years and over. There will be five winners, entitled to one 500 Million Limited Edition PS4 Pro. The prize is non-transferable and non-refundable. There is no cash alternative.